That famous bird is the star of your Thanksgiving- so selecting it and cooking it the easiest and the safest way – especially if this is your first Thanksgiving dinner – is of the utmost importance. First – decide if you want to go with fresh, unfrozen turkey or a frozen one. Remember that a free-range and large turkeys will be bit tougher and have stronger flavour. If you decide to go with frozen turkey, plan ahead so that you can thaw it properly. Then decide if you want to stuff it or not. It is not a problem to cook the stuffing outside of the bird – it is actually more and more recommended by food experts. Make sure you have an accurate meat thermometer to get your turkey properly and fully cooked. If you buy frozen turkey, the safest way to thaw it is in the refrigerator. You can also thaw it in cold water or in the microwave. Keep the turkey in wrapping you bought it in, place in a pan and leave in the refrigerator for 24 hours for each 5 lbs. of weight. That would mean you need to leave large turkey defrost in your refrigerator for about 5 days – something you need to take into consideration when purchasing it. Remember that giblets and neck are usually packed in the neck and body cavities of frozen turkeys. You can take them out near the end of thawing period – it will speed up the thawing process and you can use them to make turkey stock for your gravy. First thing you need to make about is that the turkey is in a leakproof package. It will prevent bacteria form getting to the meat and also prevent poultry tissues from absorbing water – that would ruin the meat. You will need to change the water about every 30 minutes and you will need to calculate about 30 minutes per pound of turkey. And make sure that you start cooking the turkey right after thawing in the cold water. If you decide to use this method, you will need to remove the turkey from the wrap it came in. Consideration has to given to the fact that most plastic wraps and other packaging materials are not designed for microwaving and may contain chemicals that would transfer into the meat. The best approach here is to actually consult manufacturer’s instruction and start cooking immediately after defrosting. A whole turkey purchased fresh (not frozen) may safely be refrigerated up to 2 days before roasting. Do not stuff your turkey, until you are ready to start cooking it. Rinse the outside and inside of the bird under cold, running water. Cut away and discard any fat. Place the turkey on layers of paper towels and make sure it drains well. Pat outside and inside dry and sprinkle the cavity with salt and pepper. To do the stuffing part, stand the bird on its tail in a large bowl and using a tablespoon, stuff the neck cavity first. When done, pull the neck skin over the dressing and fasten it to the body with a metal skewer. Then turn the bird, place neck end in the bowl and stuff the cavity loosely with your dressing.It is important to stuff the dressing fairly loosely – it will expand during cooking. Then remove the turkey from the bowl and place, breast side up on a clean working surface. Pull the legs close to the body and tie the ends together with cotton string. Then fold the wings under the bird – it will provide a platform for roasting. When the turkey is prepared like this, place it – again breast side up on a wire rack in a shallow roasting pan and brush all exposed parts with vegetable oil. The sprinkle with your choice of herbs, spices, salt and pepper. Before placing in the oven, you will need to insert a meat thermometer. Make sure you insert it into one of the inner thighs near the breast, making sure the tip of the thermometer is not touching a bone. Many commercially prepared turkeys are packed with a disposable thermometer, which is inserted into the breast. This thermometer should pop when the bird is done – but – I definitely recommend using proper meat thermometer – it is a lot more reliable. The additional benefit is that you can actually watch when the turkey is close to being done – and that will help with preparation of rest of your meal. Cover the turkey with extra-heavy aluminum foil – leave space between the bird and the foil – that means lightly tucking the foil around the front, back and sides of the bird. 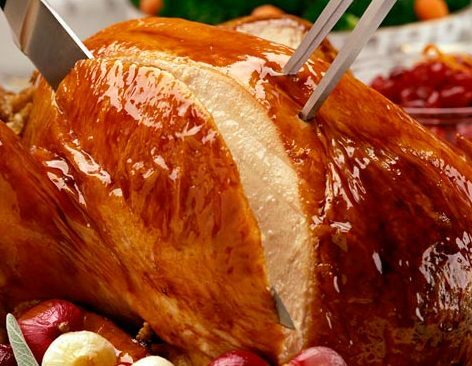 Do not add water to the pan, and roast the turkey until your thermometer reaches 180 F and juices run clear. Roasting time will vary depending on the bird and your oven as well. That is why it is important to use reliable meat thermometer. When you insert thermometer into the dressing, it need to read 165F for food safety. Remove the aluminum foil about 30 minutes before the turkey is done to complete the browning. When your turkey is cooked, remove it from the oven, place it on a serving platter or carving board; cover loosely with aluminum foil and let stand for at least 10 minutes before carving.